I’m traveling this week, so blogging is lighter, but I wanted to share two powerful visualizations for your consideration. Both are about media and our relationship to it in 2018, albeit concerning two different topics. 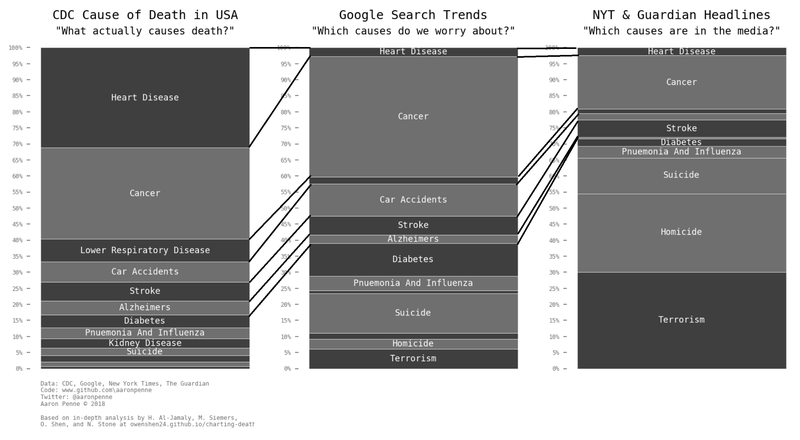 This animation shows the percentage share of top causes averaged from the Center for Disease Control and Prevention (1999-2016), Google search trends (2004-2016), and headlines from the Guardian and New York Times (2004-2016). Click to get full size version. Clearly the way we imagine death differs in some deep ways from how we actually die. It’s fascinating to see how heart disease has so little attention, how massively we prefer to think about homicide and terrorism instead… and how cancer holds our attention in a way that’s not too far away from the truth. I would quibble about the third column, since it picks media outliers. I’d love to see stats for American tv “news,” as you readers might guess, but this is still useful. At a presentation level, I admire much in this. The gif is a fascinating means to share this data, but the team does other good things. Note their clear naming and sharing of data sources, which is not a universal habit, especially for meme-maker. Note, too, the power of social, as someone else created the second visualization, inspired by the first, and the post names and links to them. Along those lines check out the discussion thread, which not only broadens one’s understanding, but led to changes (improvements) in the original post. The creators also shared their data on Github. Consider this an information or digital literacy lesson. Which is both entertaining and breathtaking to watch and hear. The fakery was built using Adobe After Effects, a readily available piece of video software, and FakeApp, an artificial intelligence program that made headlines in January when it was used to transplant actor Nicolas Cage’s face into several movies in which he hadn’t appeared. Sosa first pasted Peele’s mouth over Obama’s, then replaced the former president’s jawline with one that moved with Peele’s mouth movements. He then used FakeApp to smooth over and refine the footage — a rendering that took more than 56 hours of automatic processing. That is a lot of work, and involved a major media outlet… for now. And yes, a careful viewing shows awkwardness and small synch problems. How many watch that carefully? Deepfakes (the current term of art) could easily play a major role in changing the very important video landscape. I first wrote about this here. One final detail: “Obama” calls for careful video viewing. He does not call for increased trust in authorities. That’s an interesting example of the new digital literacy politics I’ve been talking about. This entry was posted in digital literacy, technology and tagged tv, visualization. Bookmark the permalink.